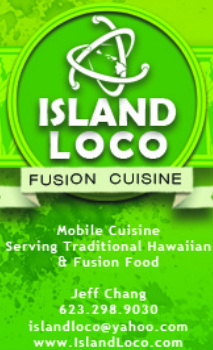 We are able to bring the spirit of Hawai'i to your event. Whether planning a wedding, lu'au, graduation, employee or customer appreciation luncheon, we are able to cater to your needs. Please let us know how we can make your party/event a success. Private Event - You would like to pay for your guests meals. Window Service - Your guests would order from our window. Luau/Buffet Service - You would like a buffet style service where chaffing dishes are set up for your guests. Sampling - You would like to serve your guests a 3 course meal within two hours. There would be appetizers for the first 30 minutes. Main course for 60 minutes. Dessert for 30 minutes.